Ready to party like it’s 1985? You better be. After Ivan Drago went curiously unmentioned in the first Creed movie during discussions of Apollo’s death, devoting an entire sequel to the Dragos is welcome compensation. It seemed an inevitable match-up, with the Creed family having never previously gotten any sort of restitution. 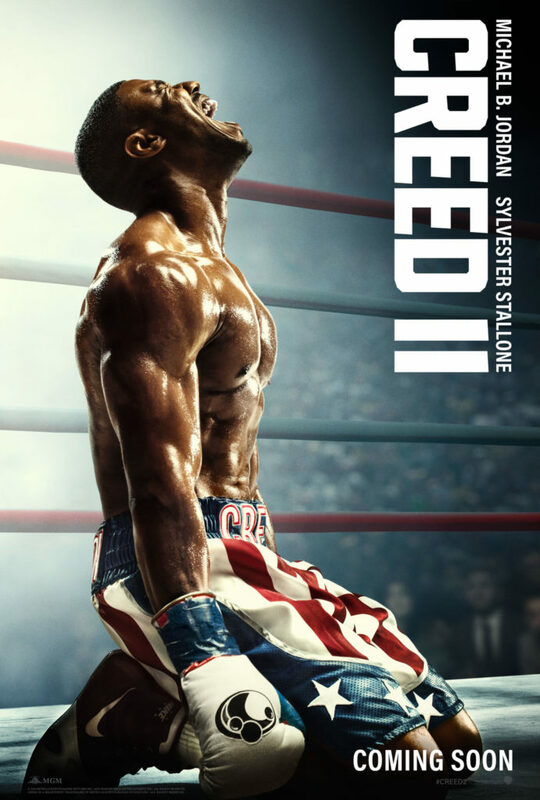 But rather than a typical revenge movie, or worse, a monster movie where the monster comes back to kill his previous victim’s kid, Creed II doesn’t waste its chance to take a tragic event and make something good out of it. Adonis Creed (Michael B. Jordan) is rising up, making a name for himself, and soon becomes the World Heavyweight Boxing Champion. The problem is he doesn’t FEEL like a champion. He may have the belt, but he can’t shake the cynicism that something’s missing. Until one day when he’s challenged by Viktor Drago (Florian Munteanu), son of Ivan Drago (Dolph Lundgren), the monstrous Russian boxer who famously killed Apollo Creed three decades prior. “Donnie” jumps at the opportunity, albeit without the support of Rocky Balboa (Sylvester Stallone), who’s still traumatized by his own fight against Ivan Drago and believes Viktor will be just as dangerous for Donnie as Ivan was for Apollo. The feeling of unfinished business is palpable throughout. Right in the opening moments, we see the Dragos training together, and they are an impressively deadly pairing. It’s one monster creating another monster. Unlike Donnie, Viktor has nothing to lose and is willing to do whatever it takes to win. He’s built like a tank and will bulldoze anyone in his way. While it’s easy to imagine the Dragos as one-dimensional villains, there’s very much a human component at play here. Ivan’s posh lifestyle in Russia was forfeit when he lost to Balboa in ’85, and now he’s trying to use his son Viktor to get the glory days back. Viktor does his best to be the unbreakable fighter his father wants him to be, but manifestly hangs his head in shame on every single misstep. And all that helps the Dragos feel like a real family. If you were expecting the monster from Rocky IV to make his triumphant return here, sorry, he just doesn’t. This is not a Cold War-era movie. It’s not all one-liners and birthday robots. What you get instead are a disgraced father and son who have been training for 30 years to reverse the events that caused their family’s ruination. Over in the USA, Donnie and Bianca (Tessa Thompson) are married with a baby on the way. Donnie has finally escaped his father’s shadow but remains undecided on what path to forge for himself. Nothing comes without a price in Donnie’s life, and Michael B. Jordan plays it to perfection. He’s a fighter who’s always fighting something, whether it’s an opponent in the ring, his insecurities about who he’s supposed to be, or a potential medical condition for his unborn child. Ego holds him back more than anything else, which makes it feel like more of a traditional Rocky sequel; i.e. something we’ve seen time and time again. Bianca continues to battle her progressive hearing loss, and Donnie fights with her by learning sign language. And while Donnie worries about what kind of father he’ll turn out to be, there’s almost no worry from Bianca about what kind of mother she’ll be, especially since she’s the one who’s going deaf. It just seems like such a missed opportunity for the strong female lead. Once again, Rocky is relegated to a supporting role, and while he doesn’t deliver the Oscar-nominated performance he gave in the previous movie, he still proves he’s one of the most essential parts of Donnie’s life. These are two people who are definitely stronger together than apart. Rocky provides the tools and Donnie wields them masterfully. The boxing scenes, while big and loud, are not nearly as intense as in Creed I or even previous Rocky entries. Viktor Drago is gigantic and Donnie fights his heart out, but fight scenes, like any scenes, should have a narrative too. Big punches and loud noises just aren’t enough. Creed II may cater more to fans of Rocky than those loyal to Creed I, but there’s no denying that it keeps the entirety of the franchise alive and strong. Although you can’t help but wonder if they should have stuck more to the Creed brand than the Rocky brand, even if they are bred from the same stock. Donnie spent the entire first movie trying to escape his father’s shadow and then all of the sequel diving right back under it. But if you’re a fan of the entire series like me, there’s something captivating about watching such great characters over a decades-long period. You feel like you’ve been with them on the most important steps of their lives. But after eight movies, there are only so many ways to surprise the audience via boxing. There’s a cameo or two that may launch you out of your chair, but if you’ve seen a Rocky movie before, you pretty much know what to expect with Creed II, even if it feels like Rocky VIII most of the time.